Rocks and Light breed poetry in my bones. Chapters full of adventures, long roads traveled and yet to travel. They do not sit alone. I stare. I soak it all up. (Enjoying other poets, I'm linking up here today). 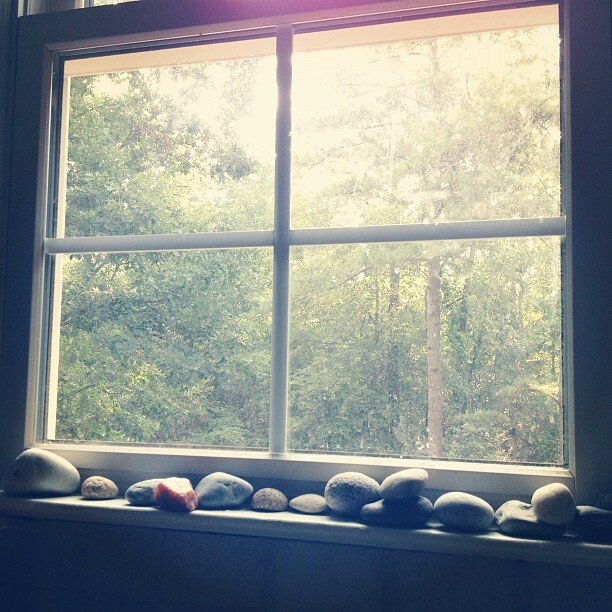 We used to have a shelf in our back (mud) room just like this one filled with stones and shells we'd gather at the beach and, which over looked our trees in the back yard too. Love the play with the rocks and light and all of the connections to nature. Many more adventures left and roads yet to travel. Happy travels. well, that's very pretty. Rocks/stones certainly represent a great stability as well- nicely conveyed. k.
i hope you took that photo because that spot is quite serene :) as are your words here. I did. You make me blush :) Thank you. ohhhhh...how I love that picture and the way you brought the rocks to life, if rock and light can be best friends, I hope that the sun can shine forever and it will be a relationship that never ceases. Great writing. Rocks are my poetic friends. They call for words. We can feel the strength emanating from the rocks to complement the serenity of the garden outside. Great write Willow! Oh Willow. How your words do my soul so much good. You make me want to write. And you should my friend. I have seen those words that lay within your heart. Write! this is beautiful and ephemeral, and i could survive breathing ephemeral. Thank you Brianne, your words here in this comment are poetry. the line that most captured my imagination? this is a story in and of itself. You are very right. Maybe one day I will be brave enough to tell that story. Thank you for your comment.